Barack Obama leads the entire Republican field in both Wisconsin and Iowa, two states that were hotly contested in 2000 and 2004 but that he won easily in 2008. Obama is not popular in either state. In Iowa just 45% of voters approve of him to 48% who disapprove. Independents split against him 43/47 and only 79% of Democrats think he's doing a good job while 87% of Republicans give him bad marks. It's a pretty similar story in Wisconsin. There an equal 45% of voters approve of him with his disapproval number standing at 51%. Independents go against him 40/52 and 94% of Republicans disapprove of him to 86% of Democrats who rate him positively. Obama's not running for reelection in a vacuum though and given the GOP alternatives he still leads in both of these states. In Wisconsin he's clearly weaker at this point than in 2008, when he won the state by 14 points. He leads Mitt Romney only 47-42. And while he does have double digit advantages over the rest of the Republican field- 10 over Rick Perry at 50-40, 12 over Michele Bachmann and Sarah Palin at 51-39 and 52-40 respectively, and 14 over Herman Cain at 50-36- for the most part he's not matching his margin of victory from last time. It's a different story in Iowa though and that may bode well for Obama in terms of what happens when voters get a lot of exposure to the Republican candidates. There he actually exceeds his 2008 margin of victory against the entire GOP field- he's up 10 on Romney at 49-39, 13 on Perry at 51-38, 17 on Bachmann at 51-34, 18 on Cain at 51-33, and 21 on Palin at 54-33. Iowa's a closely divided state in terms of its partisan loyalties, meaning it's one of those places where independents really do make the difference. Romney's favorability with them is 27/55. Perry's is 23/52. Bachmann's is 22/60. And Obama has leads of 13, 17, and 17 points respectively with independents over the three of them. What those folks have to say to make the Republican base happy doesn't look like it will serve them well heading toward November. It's just one poll and one state but it points to the possibility that Obama can win with a 45% approval rating because the GOP field is so bad. One last point- with Romney doing 5 points better than Perry against Obama in Wisconsin and 3 points in Iowa it's another data point showing that the Perry surge is good news for Obama's reelection prospects. Those Iowa numbers are very encouraging. Iowans have seen what the Republicans have to offer and they are not into it. If there's any kind of economic recovery by November 2012 and a true nut like Perry is the GOP nominee I think this could be a double digit win nationally for Obama. If these polls are accurate, it just goes to show that this country might be beyond saving. If...Perry is the GOP nominee I think this could be a double digit win nationally for Obama. And a horrible, horrible loss for America. 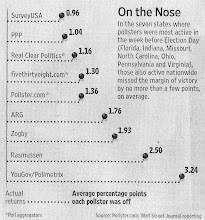 Hey guys from PPP, I´m no fan of Ron Paul at all because I´m a Democrat, but you said that you will include the Top 5 of your primary polling for your future general election matchups. Paul is currently 5th in your poll, because Palin and Paul are not running or have not declared. Also, Paul is currently 3rd in the Gallup poll, which came out today. Therefore you need to include him. I think the Iowa results are very foretelling, because Iowans have actaully gotten to see and hear the republican candidates, more so than any other states.. Very interesting to see that Obama beats everyone by a greater margin than in 2008. If these polls aren't accurate, this country could be beyond saving. It's late August and you REFUSE to include Ron Paul? This is damaging and upsetting. Please rise above what may be understandably upset volunteers or even provocateurs. The Paul supporters want a fair shake. You know what boat they are in Tom. We tell people not to call, but they are individuals. Please do not take it out on the campaign. You need to include Paul. There is no excuse for having Cain in place of him. Also Perry is by far the biggest threat to Obama. And the pros know it. To suggest otherwise based on name recognition and still floating rumor is dangerous to Obama's prospects, because they may not be smart enough to realize the true electoral gift is Mittens. Mittens is the Dems best hope. But pollsters know numbers, and rarely politics. Something just does not seem right about these Iowa numbers. Other outlets had the race tied a month ago and Romney AND Bachmann with leads. Something just seems off for Obama to be leading double digits among all the candidates. Wisconsin seems pretty accurate though. The GOP field is so bad? Obama is such a depressing President. Constant whining about the wealthy and yet he tries to emulate them everyday in everyway. What a hypocritical dufus. I live in Iowa, and these results don't surprise me a bit. Obama is the most popular pol currently in politics, even when that popularity is only 40-45%. Most others are far more hated. Many races in 2012 are going to be about being the least hated, that is new norm. People are much more motivated by the negative than anything positive. Compared to Bush, Obama is 20 percentage points below at the same month, same year. Bush had 60% popularity, now. I hope Obama gets kicked out. What a loser for our country. He uses the black and youth vote and they will vote us down the tubes. They don't want success. They want a country with a majority of people of color. We are doomed. And I don't care what color you are, Tom Jensen. Rick Perry is a far right wing extremist. The fact that he is leading the GOP polling now just shows how off the rails the whole Republican Party is. Just give the President More than a One Term Congress to work with All of America, not just act on behalf of Corporations United, and deny the People the benefits, based on not getting a tax cut, while keeping the economy hostage for the wealthy to prosper and the rest of America Suffers. 2 year President without a Congress... nah ! its time to throw out the Republicraps. Americans are getting fussier, and such is dragging down the approval ratings for everyone. It's just as well. The margin by which President Obama leads Romney is far wider than the margin by which either Gore or Kerry beat Dubya in Wisconsin in 2000 and 2004. if the election were held today (which is like saying that if cats had wings they would be strong enough to fly), then President Obama would be re-elected. This is after the Republicans spent a huge amount of money to defend some State Senators in districts that President Obama lost in 2008 in what was basically the only game in town. Iowa again looks like a disaster for any Republican. Sure, the Republicans can win without Iowa and Wisconsin (2000), but they can't win while losing either state by more than 5% because a bunch of states then go along. The Republicans have been campaigning; the President has been governing -- sort of,at least to the extent that the Republican-dominated, lockstep House allows.